Gas grills are great for quick, easy grilling in the summer, but they don’t offer the same flavor or intense heat that you get from grilling with wood or charcoal. At home, we opt for natural hardwood charcoal. The best way to light your grill quick is to put newspaper or cardboard under the charcoal and light it, let the coals turn gray and wait until they are mostly covered in ash before you start grilling. At home, use a charcoal chimney, which will help the coals ignite more quickly. Place your paper in the bottom of the chimney, pile the charcoal on top, and light the paper from the bottom end of the chimney. Do not use lighter fluid—it can affect the taste of the food. Once the charcoal is going, carefully pour it out of the chimney and into the grill. We suggest pouring the charcoal into a pile on one side of the grill, so you have a hot direct heat zone, and a cooler indirect heat zone. This is sometimes called “banking the coals” to one side. Doing this allows you to char your ingredients on the direct heat side, then move them over to finish cooking them without burning them on the indirect heat side. Or, ditch the grill grates altogether and try cooking directly in the embers, a technique we use often at Death & Taxes. This is where grill baskets really come in handy. Pile hearty ingredients (like oysters, for instance) into the grill basket, and then carefully nestle the basket into the embers of your charcoal. Get the recipe for roasted oysters here. Or, try cooking delicate vegetables in the grill basket, like corn kernels. See our recipe for embered corn below. Classics are classics for a reason: we love to grill steaks, sausages, chicken thighs, and corn just as much as the next person. 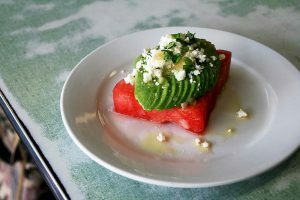 But if you want to get fancy and impress your friends, try grilling avocados or peaches. Wipe the cut surface of the fruit with neutral vegetable oil before you place it cut side down on the grill. Soft delicate ingredients like peaches only need a few minutes on the grill, so watch carefully. Serve peaches with ice cream, or as part of a savory summer salad. Make sure your grill is set up away from the house, never leave it unattended, and always have a backup plan in case your fire gets bigger than you can control. Lastly, cleaning your grill is very important. The most effective way to clean your grill is to use agrill brush and a hot fire. Let the grill get really hot so it burns off whatever's left on the grill, then use the brush on the grates to finish cleaning. Prepare a grill with charcoal; arrange the charcoal in an even layer. Place a grill basket with fine holes directly on coals to preheat for about 3 minutes. 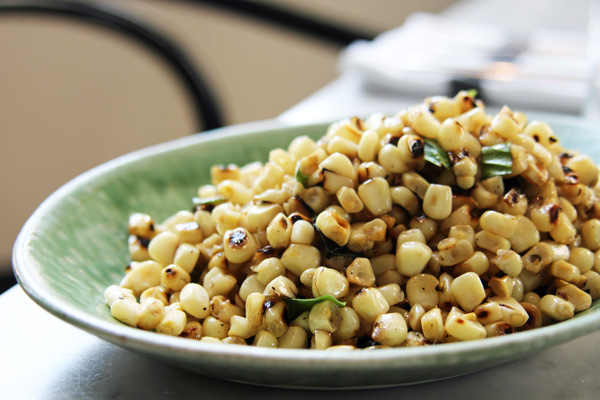 Add the corn kernels, and a few pieces of torn basil to the hot basket and season with sea salt. Roast directly on the coals until the kernels start to char, about 3-5 minutes. Be careful not to overcook, especially with fresh sweet corn. Remove from heat and transfer the corn into a large metal mixing bowl. Toss with the butter (it will melt from the residual heat of the corn), more torn basil, and the finely grated zest and juice from both limes. Add more sea salt to taste, and serve immediately. These oysters are the stars of the show at Death & Taxes, where the wood fire grill is the focus. If you make the preserved lemon gremolata and the chili butter ahead, these come together pretty quickly. Serve them as an appetizer to a grilled steak. Make the preserved lemons: Thoroughly wash and scrub each lemon. Slice each lemon as if you were cutting it into quarters lengthwise, starting from the top and cutting only to within ½ inch of the bottom; do not cut all the way through. In a mixing bowl combine the salt and sugar. Carefully pack each lemon incision with the salt mixture and place them with the incisions facing up in a container just large enough to fit them snugly. (A Tupperware or other square container with high sides will work.) Place a layer of plastic wrap directly over the lemons, inside the container. You want to create a seal so the lemons are protected. Place a small plate or lid smaller than the container on the lemons to weigh them down. Keep the container at room temperature for 4 days to a week. Remove the weight and plastic. Cover the container with tight fitting lid and store in the refrigerator. The lemons should be ready to use in about a week and will keep in the refrigerator for about a month. They can also be frozen. Make the gremolata: Carefully remove the rind from ½ a preserved lemon, being careful to remove all pith. Finely dice the rind and set aside. In a food processor combine the garlic, parsley, lemon juice. Pulse until the garlic and parsley are finely chopped. With the motor running, slowly drizzle in the olive oil. Transfer to a mixing bowl and fold in the diced preserved lemon. Season with fine sea salt to taste. Make the oysters: Prepare a charcoal grill, removing the top grill grate. In a medium bowl, combine the butter, lemon juice and zest, and chili paste with a fork until smooth. Line a grill basket with rock salt or crumpled tin foil. Arrange the oysters in the basket, in an even layer (you may have to work in batches), being careful not to tip them. Top each oyster with about 2 teaspoons of the butter. Place the basket directly in the embers and roast for about 5 minutes until the butter is melted and starts to boil. 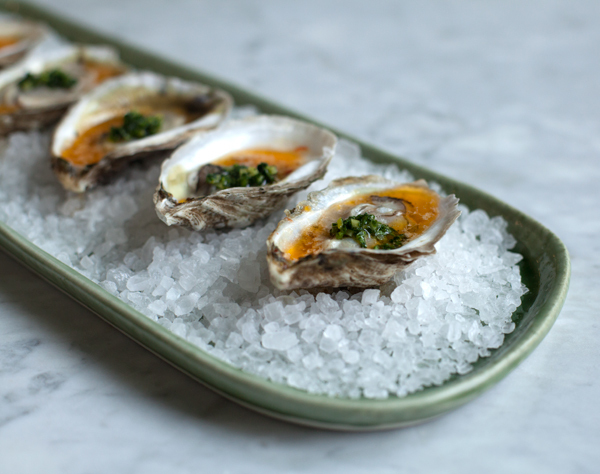 Transfer the oysters to a platter and top each oyster with ½ teaspoon of the gremolata. Serve warm. This oyster mushroom dish is available at Poole's Diner in some form all year round. 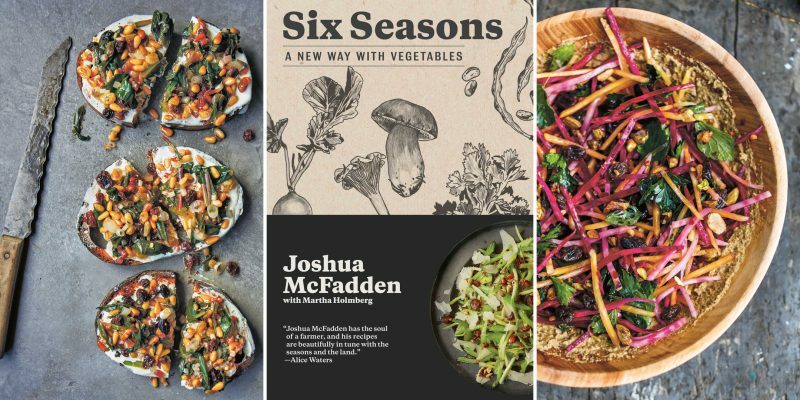 In the summer, we might use sweet corn; in the winter, brussels sprouts or cauliflower. 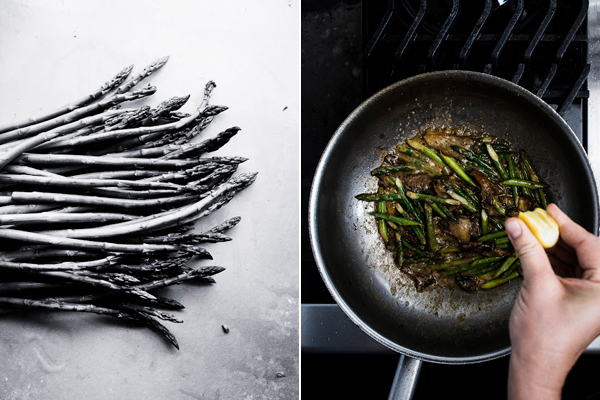 But during spring, you'll always find it featuring asparagus, and it might be our favorite version of all. 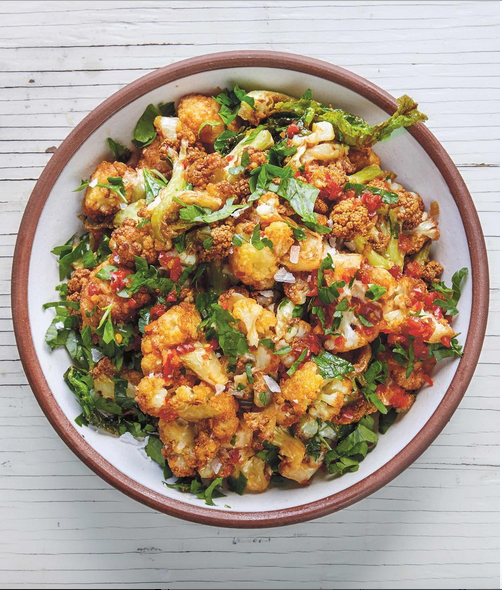 This recipe is excerpted from our cookbook, Poole's: Recipe and Stories from a Modern Diner, which is available for purchase here or anywhere books are sold. In a large skillet, heat the oil over medium heat. Add the mushrooms and let sear, stirring a few times, until the moisture they release has evaporated and the edges begin to crisp and they get caramelized. Season lightly with salt. Add the shallots and thyme and cook for 1 minute, stirring to combine and coat everything. Stir in the asparagus, then add the sherry and deglaze the pan by swirling and scraping the bottom of the pan to release any browned bits. Cook until the liquid is reduced by three-quarters, stirring occasionally; this will take about 3 minutes. Add the cream and let it reduce until it’s thickened slightly and coats the asparagus and mushrooms, about another 2 minutes. Remove from the heat and stir in the cold butters. Stir in the lemon juice, season with salt to taste, and serve immediately. Note: We make porcini butter by reconstituting 1 ounce of dried porcini mushrooms and blending them with 1 cup (2 sticks) butter. You can substitute regular unsalted butter if you don't want to take the extra step.